In advance of the 1,400th Anniversary of St Columbanus’ death in 2015 I was delighted to attend a range of excellent events recently to remember the famous Saint. Whether it was by attending the “On the Way” Concert on Friday 22 November 2013 at Bangor Abbey or the Ecumenical Church Service at Ballyholme Parish on Sunday evening together, Working as One, we were able to show positive influence of St Columbanus. 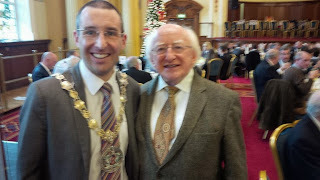 In celebration of Feast of St Columbanus it was a great honour to meet President of Ireland Michael D Higgins as Guest Speaker at an event hosted in Belfast City Hall on Thursday 21 November 2013 by Ullans Academy, Belfast Lord Mayor Councillor Máirtín Ó Muilleoir and Dr Ian Adamson OBE. With Lord Bannside PC, Dr Ian Paisley and Baroness Paisley also present it was another positive step forward bringing people from across the Island of Ireland together. As someone who travelled from Leinster to Lough Erne, Bangor, France, Austria and Italy St Columbanus’ influence across Europe is profound helping to inspire one of the founders of the EU Robert Schuman who once stated that St Columbanus is “The Patron Saint of all those who now seek to build a United Europe”. With St Columbanus now due to be bestowed with Patronage of Europe in 2015 I am extremely grateful for the opportunity to serve as Mayor in the run up to this significant event marking 1,400 years after his death at Bobbio, Italy. 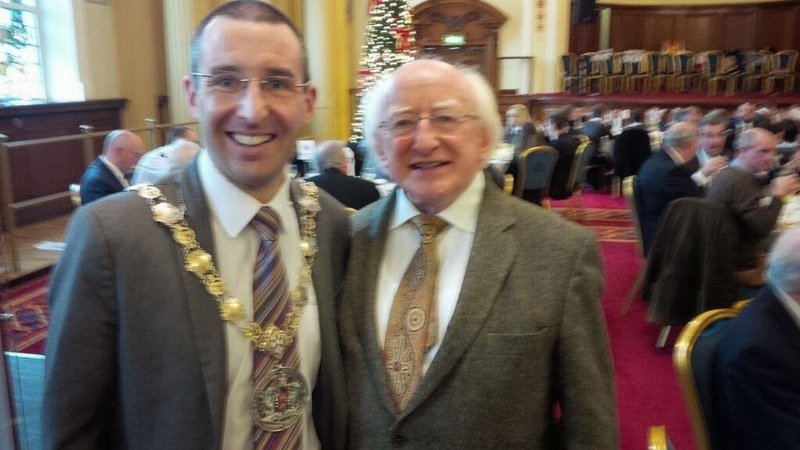 I greatly enjoyed celebrating his influence over recent days and look forward to other events my Mayoral year ahead as a passionate pro-European and past pupil of St Columbanus’ College.